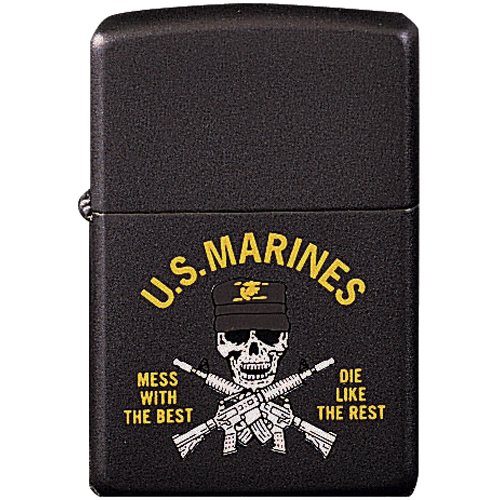 The Marines Mess w Best Zippo Lighter is a unique addition to the collection of Zippo lighters at. The lighter features the words ‘U.S. Marines’ and ‘Mess With The Best – Die Like the Rest’ printed on the front along with the logo containing a skull and two guns. The gold lettering and black and white logo truly stand out against the matte black background that covers the rest of the lighter. This lighter is typically one of those Zippos that is never out of fashion and a priced possession for anyone who owns it. The lighter also comes with the customary Zippo lifetime guarantee.